Eighteen years. That’s how long Sweden’s Little Dragon has been going. 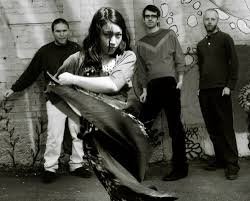 Back then it was too easy to label them as a Scandinavian act trying to ape the success of trip-hop music coming out of the south west of England; but whereas artists associated with that scene have largely faded away, Little Dragon is probably more popular now than at any time. Much of its popularity is down to Ritual Union, a track released three years ago that set the world on fire. It has become the defining Little Dragon song, its excellence unsurpassed and will be forever more. Ritual Union is simply one of the greatest tracks in the history of recorded music, and for Little Dragon to top it is nigh on impossible. Little Dragon, however undeterred, is back with a new number called Klapp Klapp taken from an album titled Nabuma Rubberband which will release summer 2014. The group says its new music is inspired by Janet Jackson’s slow jams, though it’s hard to think of any of her songs having this kind of meticulous production. The sounds and details on this record are breathtakingly detailed, not to mention maddeningly groovy. The music video’s rather unnerving, though.